The Personal Pathway can help you begin trusting God and others with who you really are. Choose this path to explore how to build trust in your daily personal life. The Cure explores the difference between pleasing and trusting God, and the importance of trusting God and others with yourself. This book, told partly through narrative and partly through teaching, touches on our view of God, sin cycles, forgiveness, friendship, destiny, and much more. As you begin walking this path, this book is your starting point. While reading The Cure, follow the included study guide at the back of the book (you can view the cinema clips here). Choose at least one person in your life to share what you’re learning about yourself through The Cure. This helps you to practice trusting others with yourself. Sign up and become a Friend of Trueface! You'll receive teachings and updates about upcoming events or new resources right to your email. 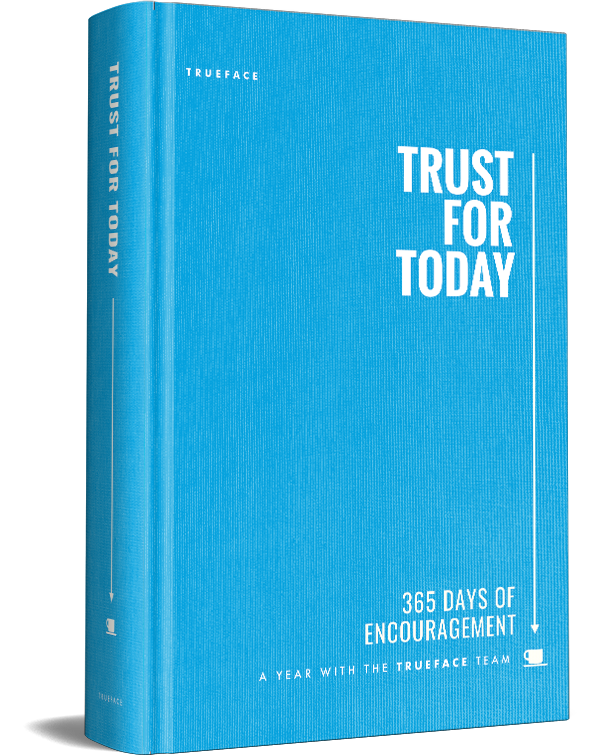 This 365 day devotional, written by the whole Trueface team, invites you to experience trust each day, from the mundane to the exceptional, from the deeply sad to hilarious. Touching on business, family, donuts, friendship and Adirondack Chairs, Trust for Today invites you to grow in trust one day at a time. Make Trust for Today part of your daily routine. Invite a friend, partner, or family member to join you in daily growing in trust. The Heart of Man is a docu-drama weaving together documentary interviews and the parable of the prodigal son, set in Hawaii. This film invites us as sons and daughters to rediscover how God sees us in the midst of our brokenness and rebellion, and invites us all to the banquet the Father is throwing. Follow this film with the study guide, designed to be used individually, as a group, or as a discipleship tool, to dive deeper into how we relate to the Father and how we view ourselves. Read The Cure and Parents with one member of your family, whether that’s a spouse, child, parent, sibling, or other relative. Think and pray on the questions at the back, and discuss them with the person you’re reading with. Download the Family Affirmation Tool, and take the wonderful risk of trying it out with your family. Join us weekly for a 15 minute podcast, where we talk about the ups and downs of our own paths, and what the Word of God has to say about it. These short segments of truth and grace will help you know you’re part of a community as you take this journey. Sign up and we'll keep you up to date on this exciting new course! Is God with us even in our worst? Does God love us the same even on our Worst Day? This is a full access pass to John Lynch's journey, a life full of the winningly ridiculous and soulfully poignant. Find yourself, grace, and the God that has always been inviting you into your story. Read On My Worst Day, and consider the Awakenings John describes. Check out John’s blog, as he poignantly and whimsically considers how we apply God’s grace and truth to our every day lives. Lay it Down provides a fantastic walk through the biblical foundation of how grace changes everything. Bill Tell's excellent step-by-step thinking offers us a way back to the original good news as he evaluates specific verses. Once you have read The Cure, we invite you to let Bill Tell help you Lay it Down. The High Trust Leader Course (HTLC) explores this concept over 16 weeks through faculty-guided discussions, face-to-face tools, reading, and teaching videos. Learn High Trust Leader principles on your own schedule within each week, from anywhere in the world. You will be instructed, challenged, and encouraged in how to develop High Trust Communities. The HTLC provides teams of any size the ability to dive deeper into the gospel of God's grace which will deepen your influence. Consider who else in your life might benefit from this pathway, and reach out to walk with them.